Cardiff Blues upset London Irish 10-6 in the Anglo Welsh LV Cup at the Cardiff Arms Park and put the Exiles place in the Semi-finals in doubt. London Irish started the match leading Pool three of the Anglo Welsh cup and knowing that a bonus point victory would secure a place in the play-offs. However while the conditions were far from ideal their error-riddled display could have cost them their campaign. The Blues scored the first and only try of the match in the first half when Gavin Evans pounced on a loose ball after Exiles fullback Tom Homer failed to ground the ball behind the try line following a Rhys Patchell’s grubber. Patchell’s conversion and a 40-yard penalty miss from Tom Homer meant that Cardiff Blues led 7-3 at the half time mark. The second half saw both teams add a penalty each but while the visiting London Irish team applied pressure they could not get over the try line and the opportunity slipped away for the Exiles. 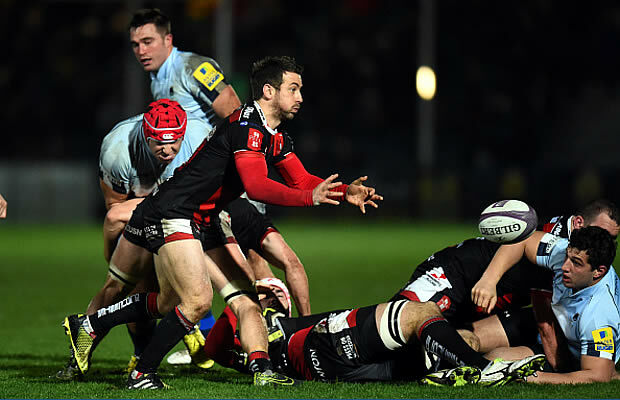 The result means that London Irish now need Worcester to beat Saracens if they are to progress to the Semi-finals. Referee: Ian Tempest (RFU) 4th competition game. Assistant Referees: Neil Perkins, Matthew Thomas.